Many pundits are going on SF Bay Area radio and saying Seattle and Russell Wilson’t passing attack have taken a steep downturn in past several games. Does your formula add weight to recent games and subtract it from September and October games? Any way of knowing if this would change results? Presumably without Percy Harvin and Sydney Rice, SEA’s efficiency is different, just as SF’s is with addition of Crabtree. I do not weight recent games more. I think you inevitably pick up some noise by doing this, although I reserve the right to change my mind about this in the future. I’m not sure Percy Harvin matters so much. He caught one pass during the regular season. With Golden Tate and Doug Baldwin at full strength, Seattle should be fine through the air. Ed has uncovered a very interesting trend here and it certainly reinforces the adage that the NFL has become a passing league. However while objectively looking at the passing numbers is obviously very useful in predicting the outcomes of games, one cannot ignore the synergy that exists between the running game and passing game. If a team is effective running the ball, then it draws defenses up and opens the field up for the passing game. 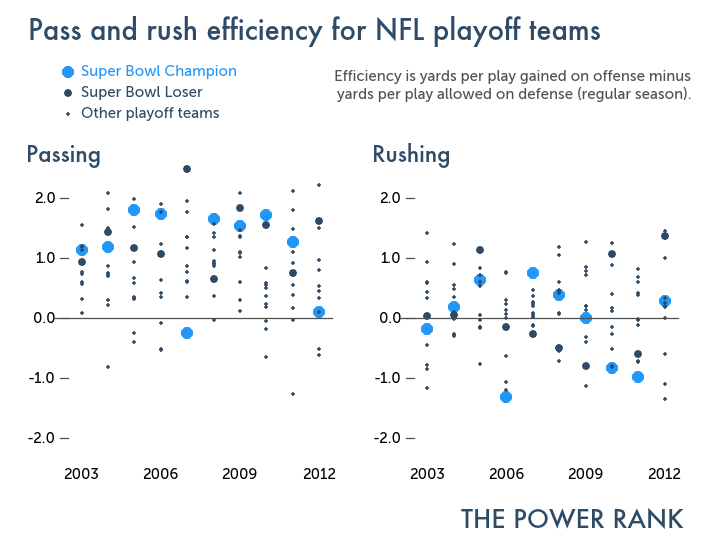 As shown by the scattergram in the article, rushing yards efficiency obviously does not correlate to making the playoffs, but does that mean the rushing game should be ignored entirely? 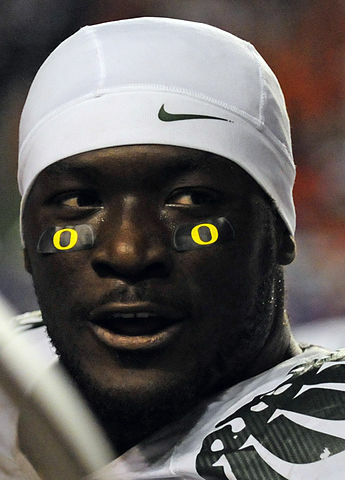 Here I think Ed is right again that YPR is much more important than total rushing yards, or rushing efficiency. If a team that is built around the passing game can rush for only 100 yards per game, but at a clip of 5.0 YPR or better, then that signals that the opportunities to air it out are there in my opinion. Marc, thanks for adding to the conversation. We can say with some certainty that looking at yards per carry won’t help you predict future games much. But I do think there is some synergy between rushing and passing via deception and play action passes. I don’t know how to quantify it, nor do I think anyone else does either. Good stuff to think about during the off season.